Painting and Sculpture for Sale. Asking Price: $300 million. 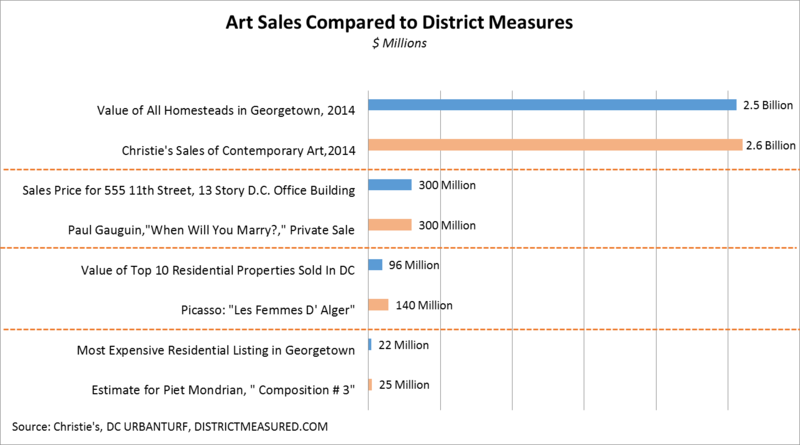 How can a handful of artworks be worth more than all the homes in Georgetown? Pablo Picasso’s painting ,Les Femmes d’Alger, and Alberto Giacometti’s sculpture, Pointing Man, will be among the highlights of the upcoming May auction season in New York. These masterpieces, which are being offered at Christie’s on May 11th, could sell for more than $140 million each, breaking the previous record for a work of art sold at auction. Just a couple of days later, during the prime hours of the Post-War and Contemporary Evening Sale, Christie’s will auction Mark Rothko’s Number 36 (Black Stripe) which has an estimate of $50 million. Rivals Sotheby’s and Phillips will also be offering works of art from Blue Chip artists who command prices well in excess of $50 million. While critics observe that art’s value cannot be measured by sales prices alone and that art has an incalculable humanitarian, cultural, and educational dimension, there is no disputing that art is a big and growing business. A 2012 study by the New York City Economic Development Corporation: “The Importance of NYC’s Auction Houses: Warhol and Picasso vs. 15 CPW and The Plaza” emphasized the important role of auction houses as a catalyst for art business and art travel to New York. The study also provided a comparison of the staggering prices paid for art to trophy buildings in Manhattan, like 15 Central Park West, where these paintings and sculptures are likely to find a home. While the auction market for art is a two-way battle between New York and London, D.C. is home to some of the most prestigious art museums in the world. Public museums like the National Gallery of Art and the Hirshhorn are among the most visited art institutions in the world. D.C. is also home to private gems like the Kreeger, a Philip Johnson designed modern day version of the Frick which houses numerous Picassos. Speaking of Rothkos, the Phillips Collection near Dupont Circle has four significant works by the Russian born abstract expressionist master in its Rothko Room. Baltimore and Richmond museums also have world renowned collections. The Baltimore Museum of Art has one of the six Giacometti Pointing Man sculptures. The Frances and the Sydney Lewis collection of Art Nouveau and Art Deco furniture, at the Virginia Museum of Fine Arts , is world class. If a single Eileen Gray chair sold for $30 million, who knows how much their collection is worth. To return to my initial question- How can a few artworks be worth more than all the residential properties in Georgetown? The answer goes something like this. The supply of artworks that command prices over $100 million is extremely limited even compared to very valuable residential properties in Georgetown or New York. Couple this limited supply (yes the Giacometti is an edition of six) with the intense demand for these artworks among the world wealthiest individuals and $100 million becomes the new norm for artworks. Most art-related price estimates and sales data in this post is from Christie’s. The $ 300 million Gauguin sale was a private transaction reported in numerous news articles. DC residential property tax data is from the D.C. Office of Tax and Revenue. D.C. Residential sales data are from Washingtonpost.com blogs , the D.C. Recorder of Deeds, and DC Urban Turf. For more information on the upcoming auctions visit Christie’s, Sotheby’s and Phillips.